What is a Soap Bag? Use a soap bag to keep your personal soap and the outside is like a washrag. Rise and hang your personal soap bag between bathing and showers, then pop in a new bar of soap when the old is used. We have two patterns here. 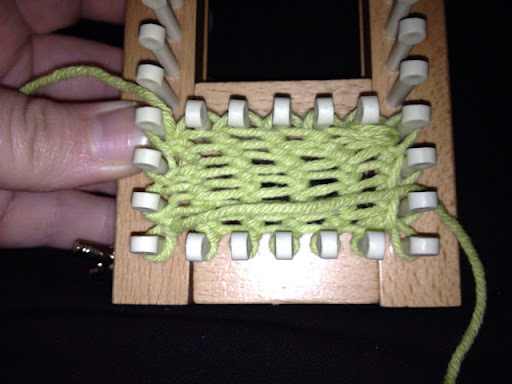 One soap bag is on a large gauge loom with 12 pegs (Knifty Knitter, Boye, Loops & Threads, etc.) 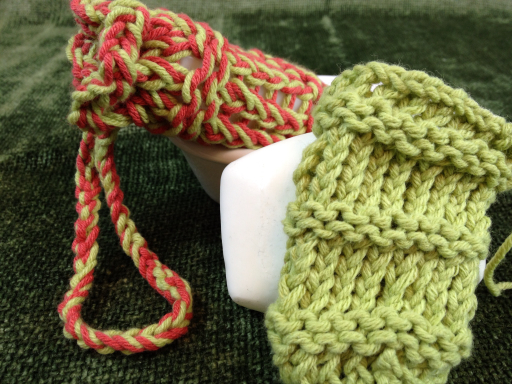 and the second soap bag patterns is for small gauge like the Knitting Boards AllnOne, Sock loom 2 or maybe a KISS loom (use the U knit stitch)! Have fun!! USES: Small drawstring sachet size Mesh soap bag for soap or small items. Add length in Ewrap rows to make a longer toothbrush caddy. Other uses Kristen suggests to use as a sachet for potpourri or scented candle chips, feminine hygiene packet for purse or bag, other small items (suggest using one more strand to hold small items). Soap bags are also great for gifting custom handmade bars of soap you may have made. Try making a Granny Round in cotton and tulle for a facial scrubby! 1.Using both strands of yarn E-wrap Cast on 5 stitches to round 12 peg loom in a flat panel. Counter-clockwise to the starter peg, work as a flat panel in EW 10 rows making sure your working yarn is back to the starter peg for the next row. 2.Leaving the panel on the loom, stretch the panel across the loom to the opposite side and place on pegs across. Now take the side stitches and place 2 stitch loops at a time (the two held as one) on adjacent pegs to stretch flat panel to fit on all pegs of the loom. Make sure to pick up ALL side stitches so your bag will not have an open hole. This is the bottom base of the bag. Wrap all pegs EW in a full circle and knit over leaving only 1 set of two strands (the two color choices). For example the side stitches have 3 sets of two before knitting over on a few pegs that have extra side stitches. 5. 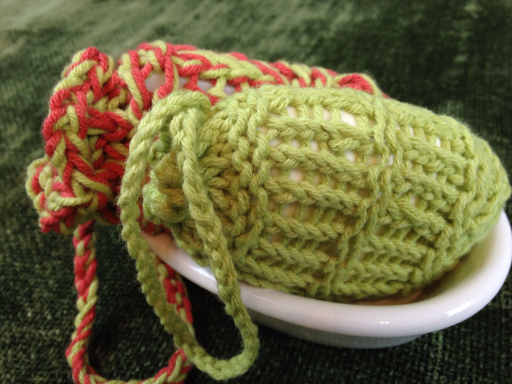 Using a size I, J or K crochet hook, chain 50 with both strands held as one. Do not tie yet. Weave the chain into the top of the bag between the knit stitch columns, just below the cast off . Weave back and forth between the outside and inside of the bag till you come to the beginning end. Tie the ends together and weave tail into the chain or simply cut off. The tied in can be repositioned into the inside of the bag if you like. Weave in all loose strands. Add bar of soap and pull drawstring to close. Hang bag up in shower or tub, wash as needed. Suggest making one for each person using the bag with many on hand to switch out for hygiene. Be sure to inspect for mildew and clean. KnittingBoard All-n-One Loom (or other small gauge adjustable loom with at least 18 pegs to be made in the round). Can also be used on one end of 48″ Universal S loom with wedge in place (use same number of stitches to cast on). USES: Small drawstring sachet size bag for small items or stretches for soap as a mesh. YARN: 1 balls cotton or cotton blend (use scrap yarn less than 30 yards). Lion Brand Cotton Ease used in sample. 1. 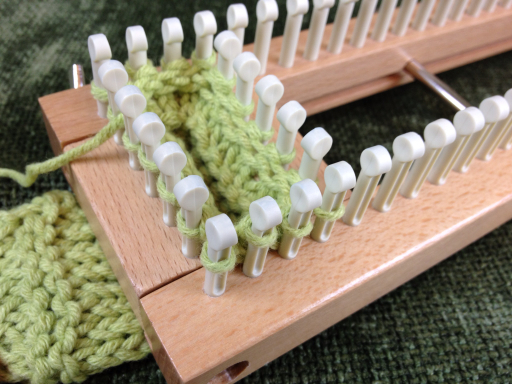 Set adjustable loom to 18 pegs. Using both strands of yarn E-wrap Cast on 7 stitches to loom in a flat panel. Counter clockwise to the starter peg, work as a flat panel in EW 10 rows making sure your working yarn is back to the starter peg for the next row. 2. Leaving the panel on the loom, stretch the panel across the loom to the opposite side and place on pegs across. Now take the side stitches and place loops on adjacent pegs to stretch flat panel to fit on all pegs of the loom. Make sure to pick up ALL side stitches so your bag will not have an open hole. This is the bottom base of the bag. Wrap all pegs EW in a full circle and knit over leaving only 1 strands. 5. 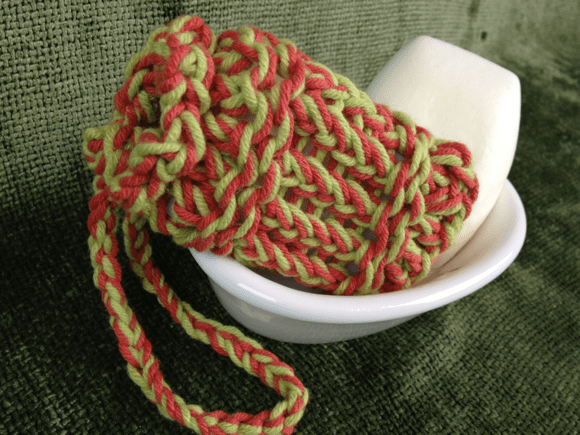 Using a size I, J or K crochet hook, chain 50. Do not tie yet. Weave the chain into the top of the bag between the knit stitch columns, just below the cast off . Weave back and forth between the outside and inside of the bag till you come to the beginning end. Tie the ends together and weave tail into the chain or simply cut off. The tied in can be repositioned into the inside of the bag if you like. Weave in all loose strands. 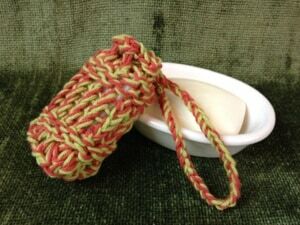 Drawstring to close the soap bag. See end of review video for cast off at about 10 minute mark. For now till new video made. 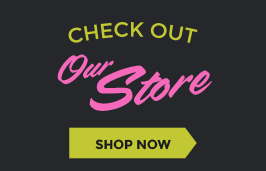 Use as a sachet for potpourri or scented candle chips, feminine hygiene packet for purse or bag, other small items. Can stretch to use as a soap bar bag. I’m knitting a top for myself, from the bottom up. How can I do a partial bindoff? I’d like to bind off the middle third – the neckline. Then continue loom knitting the 2 end thirds – as shoulders. Can you help?